Inside a new language for building structured web apps. Unfortunately, finishing and maintaining a web app are not so fun. and it has the performance chops to run large apps. especially when you have a large team. to build more complex, highly performant apps for the modern web. and good software engineering techniques. (which lets you create, modify, and run Dart apps). (the VM, which lets you run Dart code on servers). that contains a built-in Dart VM. We want you to be able to create great web apps. and when the web does better, everyone wins. thinking about web apps for a long time. the challenges of architecting web apps. how to make web apps run faster. to create more complex web applications. than what is available today. features are already landing in V8 and Chrome. from thinking about other solutions. to run across the entire modern web. push the web forward for app developers and users. Enough talk, let’s see some code. Dart code should look familiar. that evaluates and returns a single expression. rate is an optional parameter with a default value. ever used a class-based language. a way to execute Dart code interactively in any modern browser. and then click the Run button (at the upper left). The URL at the upper right of the Dartboard is a link to the code you just ran. Like most things related to Dart, Dartboard is still changing. 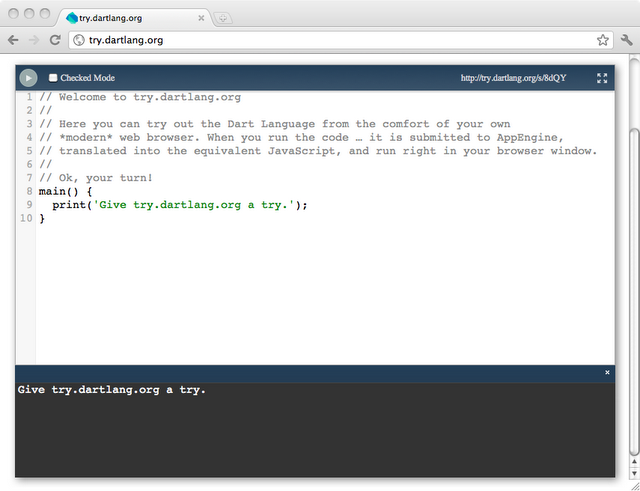 that lets you write, modify, and run Dart web apps. while any item in that program’s library is selected. (Chromium with an embedded Dart VM) to run the program. making your app available to the entire modern web. and we expect more features soon. 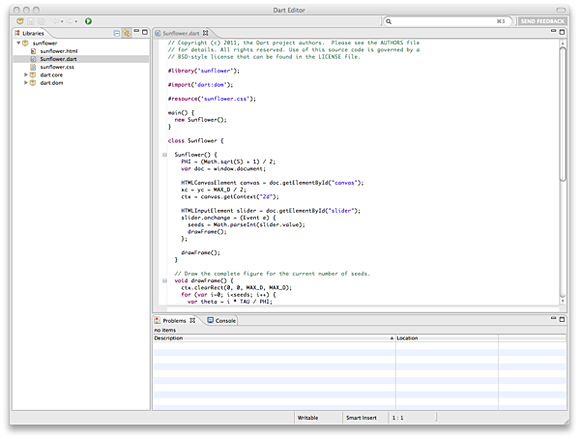 Dart Editor highlights Dart syntax. and it can quickly take you to where types and other APIs are declared. for download instructions and a walkthrough. let’s talk about the language. here are a few of the more interesting features of Dart. You can use types or not, it’s up to you. but they can help developers and programming tools to understand your code. ready to commit to an implementation. and omit types inside methods. before that app can run. can speed up startup considerably. started up in 640ms without snapshotting. With snapshotting, it started up in 60ms. which you can think of as processes without the overhead. which can’t be affected by any other isolate. is by way of messages. Isolates allow a single app to use multi-core computers effectively. that features classes and interfaces/protocols. that is the default way to create objects that implement the interface. to get a default stopwatch implementation. is a class named StopwatchImplementation. 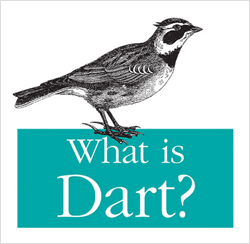 Dart takes a new approach by designing a generics system that’s more understandable. but we believe that enabling developers to be more productive trumps ivory-tower language design. We also took a fresh look at how you should use the HTML DOM. we made elements, attributes, and nodes feel natural to work with. but it would have maybe five users. a language targeted at the mainstream. help with hiding implementation details. and interface and library contracts. it’s an entire platform for modern web developers. with a few new features such as optional typing and isolates. The virtual machine is built from the ground up to run Dart code natively. and can also be embedded into browsers for client-side applications. can launch your script in the VM or web app in Dartium. and run it in another browser. so for now, don’t bet the farm on it. so we encourage you to check out Dart and provide feedback. production Dart web apps in all major modern browsers. apps for the modern web. to a large collection of classes. your code will probably need more modularity and encapsulation. and from untyped code to typed code. which is available now in prerelease. whether they’re standalone scripts or inside the browser. APIs for producing UIs for web apps. Server-side APIs for connecting to the outside world. This library is accessible only when the Dart VM is running on the server. The community has also started porting libraries that you can use. from Closure have been ported to Dart. 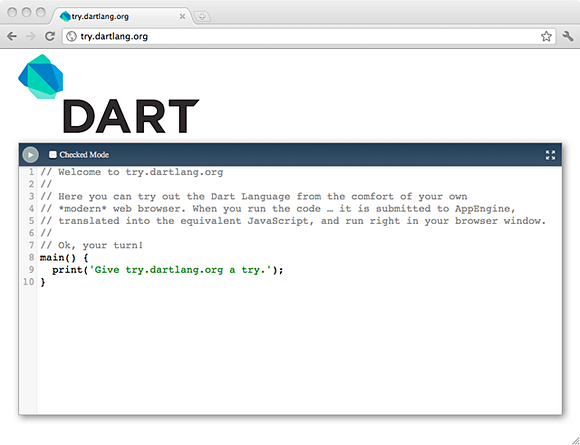 has also been ported to Dart. and shown some Dart code. it otherwise has no types. Types are optional in Dart. when you move on to an even better project). understand your intention better and catch bugs earlier. “surface area” of your program. the method body of distanceTo(). is to use types for method signatures but not method bodies. and we expect tools to perform type inference at some point. var dx to num dx, and so on. in the API reference might be a bit scary. Generics in Dart are easy peasy. Why bother with the extra ceremony? The tools and the runtime can detect bugs early on. (Fact: new List() is shorthand for new List<Dynamic>(). different types and untyped collections. pay close attention to the last two examples. The last two examples highlight Dart’s covariant generics. Dart’s parameterized types are reified. is a “list of Strings”. Revisiting the DOM to make it more Dart-esque has a lot of advantages. and you can loop through child nodes just like you can with other Dart collections. on the element and its children. // Add a child element. // Add a CSS class to each child element. you can still take advantage of multi-core machines by using isolates. different parts of a running program. managed by the Dart VM. Isolates communicate by sending messages through ports. The messages are copied so that an isolate can’t change the state of objects that belong to other isolates. To illustrate isolates at work, let’s build a simple echo service. First we will define echo(), a function to run in an isolate. Each isolate has a port, which we can use to receive messages. We’ll reply to the message via the provided reply port. The main() method creates a new isolate for the echo() function with spawnFunction(). Use the SendPort to send messages to the isolate, and listen for any responses using then(). The main place to go for Dart information is dartlang.org. You can discuss Dart at our main group. check out the Dart open-source project.